The usual suspects were at this year’s sinkhole exploration trip; Steven, Irene, Gerrie, John and Selena. These annual trips have been mainly in the Banks compartment and Venterspos area. In the early days we would drive around with Colin Redmayne-Smith and his memory. It is always a great Sunday drive, looking down mostly plugged sinkholes. We once found a sinkhole that was used as the local abattoir and one could see the bad smell coming out of it! Nobody wanted to go down it, much to Colin’s disdain, cavers have gone soft he said. With the advent of technology we started going to sinkholes with Gerrie and his Google Earth. We found more plugged sinkholes; Lemon Pot, Stinkhole, Lucky House, Jockstrap, to name a few. Some were too small to name. We came upon a group of sinkholes once where panning for diamonds had been happening. It was a precarious drive among a swiss cheese of small drops. Another method of spotting caves from the air was done by John in his microlight, with passenger Al Grant doing the spotting. An expedition was done in 2009 to the Aha Hills of north western Botswana where we scoured the hills on foot searching for caves. It was a great adventure but we did not find any caves, only giant blackjacks that had to be picked off our overalls daily and still oozed out of our skins two weeks later. So it was with great perseverance that Armageddon was found in 2013 with the help of Colin and his memory. It was in the spirit of cave hunting that we recently visited the biggest underground lake in South Africa. This is a story for another time. 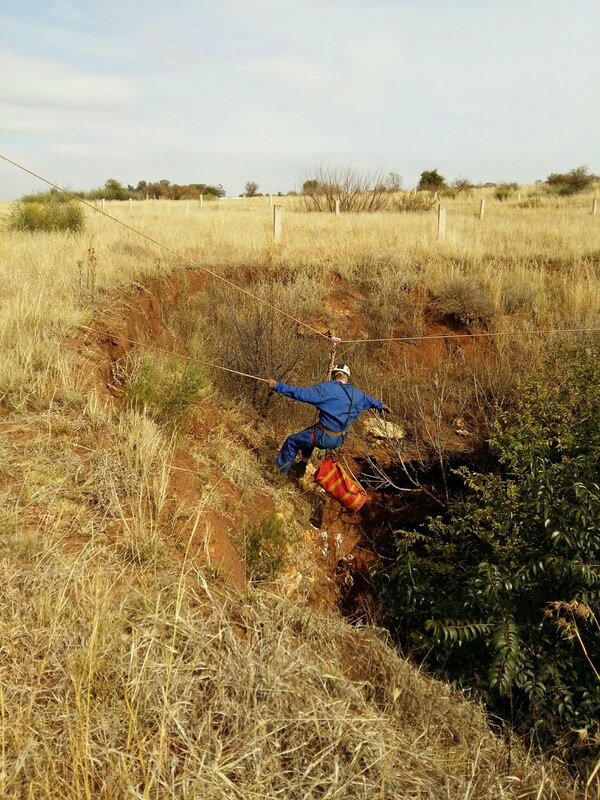 Last month we looked at sinkholes again with Gerrie and Steven using google earth. John had scoured the area in a glider plane a few days earlier. We peered down ten sinkholes and found reason to SRT down four of them. Nothing exciting found this time, but we will be back next year. SEC has an annual planned sinkhole exploration trip in winter.